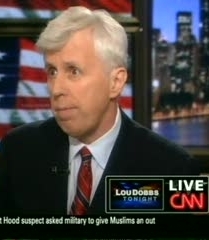 Jeffrey Lord dedicated a May 31 NewsBusters post to attacking actor Seth Rogen for allegedly issuing a tweet in 2012 bashing Mitt Romney. Why do that? To claim hypocrisy over Rogen's outrage over Washington Post film critic Ann Hornaday for suggesting Rogen's films may have inspired mass killer Elliot Rodger: "So in other words, Rogen, who now finds Hornaday’s article 'horribly insulting and misinformed' was himself out there in 2012 making a 'horribly insulting and misinformed' charge against Mitt Romney." Just one problem: Rogen didn't actually make the Twitter post Lord criticized. As Mediaite details, it came from a Rogen parody Twitter account. The real Rogen, meanwhile, is mocking NewsBusters for the stupid mistake. Seth Rogen has “parody” twitter accounts. And he’s upset with me because I mistakenly quoted one of them as real. He has called me an “idiot.” The source where I found this originally - and duly and deliberately linked - was the lefty MoveOn. MoveOn was apparently fooled by the “Real Seth” parody, which in turn fooled me, although in fact the parody was well out there. MoveOn having long ago become a parody I was quite happy to link it. So the notion that a Hollywood liberal would simply parrot this Romney/Klan story was all too easy to believe. But in fact, it was a parody. Our apologies for the error. Lord, normally a writer for the right-wing American Spectator, is best known for insisting that a black man beaten to death in segregation-era Georgia wasn't technically "lynched" because his assailants didn't hang him and there weren't enough of them to form a proper mob. Lord stood by his article even as his AmSpec compatriots wouldn't defend him.